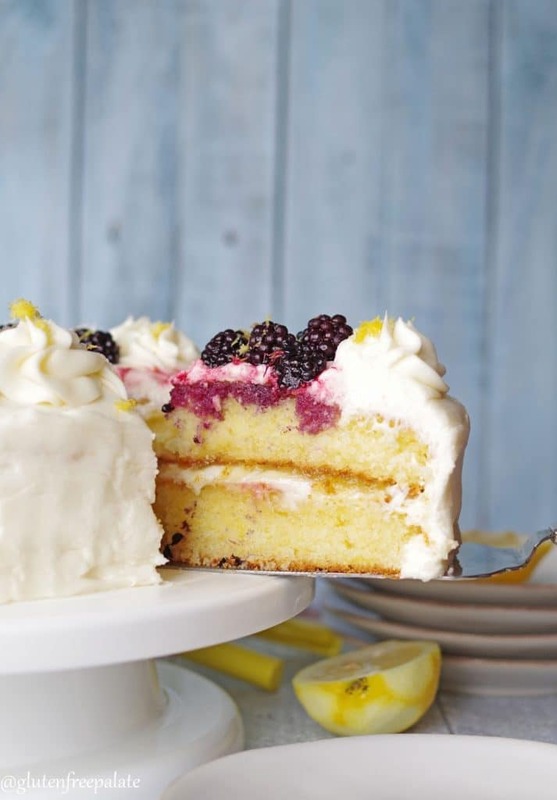 A layered cake filled with lemon curd and covered in a smooth, creamy lemon buttercream frosting, this Gluten-Free Lemon Cake will be the perfect addition to any holiday celebration. This gluten-free lemon cake recipe comes with a dairy-free option and is super simple to make. Do you love cake? Then you’ll love my Easy Gluten-Free Chocolate Cake. My Easy Gluten-Free Vanilla Cake is scrumptious too. Someone asked me if this gluten-free lemon cake was moist because I soaked it in simple syrup. NOPE. Spring is in the air. The birds are chirping, the flower are blooming, and Easter is only a couple of weeks away. Every year for Easter we make something different for dessert. Sometimes it’s gluten-free cookies, sometimes there’s gluten-free lemon cake, but grandma always brings a pie: chocolate cream pie. It’s not really an Easter type of a pie, but she brings it to every holiday meal. It’s her special contribution and we appreciate her for it. This Gluten-Free Lemon Cake is a perfect gluten-free Easter dessert. This year for Easter I wanted try something new – a fresh and tangy cake that would make everyone in our family dive for seconds. Hence the gluten-free lemon cake recipe. Do you think this Gluten-Free Lemon Cake will make a good Easter dessert? I had Easter in mind when I made it, so I hope you do. I have more Gluten-Free Easter Desserts, if you are interested. Lemon treats remind me of spring and summer. Also, Lemon is a universal flavor in my opinion, like chocolate. I haven’t met a single person who would shun a lemon dessert. If I ever do, I will happily eat it for them so they don’t feel guilty wasting it. We’re also celebrating one of my niece’s birthday on Easter. A special girl needs a special cake. She’s the sweetest (I can say that because I’m her aunt) and I am thinking she might need a giant slice of this cake to celebrate her day. There are a couple of tips and tricks to getting the right texture with gluten-free cake. First, you have to follow the recipe. So many people comment on recipe posts saying that they made a ton of substitutions and the recipe didn’t turn out. Other than the dairy substitute, I haven’t tried other substitutes in this recipe. If you use substitutions, you are doing so at your own risk. Second, you want to mix at the right time and not over-mix. When you are beating the oil, sugar, and eggs you’ll want to beat it for the time listed. This adds air which in turn helps the cake rise. These tips are relevant to most cake and cupcake recipes, not just this Gluten-Free Lemon Cake. This gluten-free lemon cake is also dairy-free! 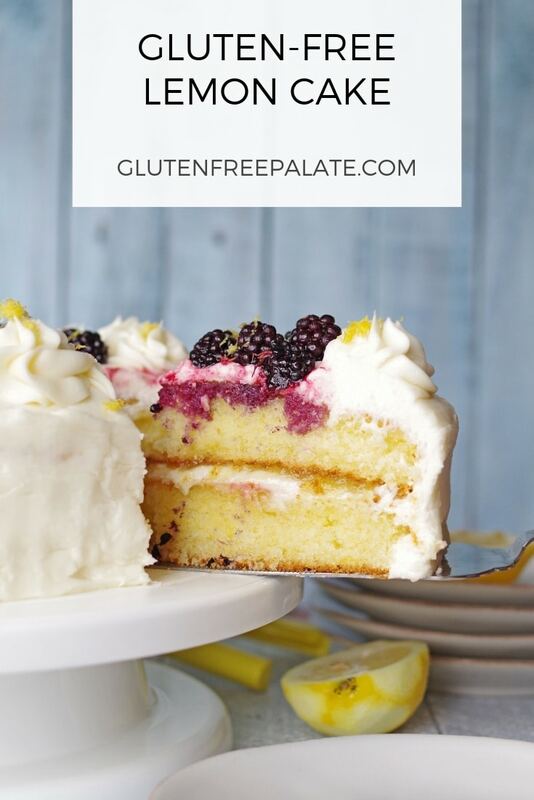 So, whether you make this gluten-free lemon cake for Easter, someones birthday, or any other special occasion, I think you’ll agree that is quite amazing and it works for most dietary restrictions. It’s better than any bakery style cake I’ve had (I know, I say that about all my cakes. I make good cakes!). When working with gluten-free flours or measuring gluten-free flour, spoon the flour into the measuring cup and level. Do not scoop your measuring cup into the gluten-free flour. The best method really is to weigh the gluten-free flour but I don’t have the ingredient weights for all my recipes yet. I’ve tested this recipe with Bob’s Red Mill 1-to-1, Cup 4 Cup baking flour, and my gluten-free flour blend. Can I use regular milk in the cake and real butter in the frosting and get the same results? Yes. You can make this cake with dairy, or without dairy. It just as amazing. Both ways deliver a delicious, tender, bakery style cake. For the cake: Preheat oven to 350°F (180°C). Position rack in center of oven. Oil two 9-inch cake pans and dust with flour; set aside. Add eggs and beat with an electric mixer at medium speed for one minute. Add flour, salt, baking powder, dairy-free milk, lemon extract, and lemon zest; beat at medium speed for one minute. Spoon batter evenly into cake pans. Bake for 28-32 minutes or until the centers springs back when touched and the centers are set. The time may vary on your elevation and oven temperature accuracy. Remove from the oven and let cool in the pan on the rack for five minutes. Run a rubber spatula along the edges of each cake to loosen them. Invert onto the cooking rack. For the frosting: In a medium mixing bowl, beat butter smooth and creamy. Gradually add powdered sugar, one cup at a time, beating well. Alternate one cup of powdered sugar and 1 tablespoon of lemon juice until all ingredients are blended. Beat in additional lemon juice if needed to obtain desired constancy. Place on cake, dome side down, on a plate or cake platter. Spread a ¼ inch layer of frosting on it. Spoon lemon curd into the center and spread until it’s a half inch from the edges. Add second cake to the top and frost the sides and tops. Tip: I like to put frosting in a piping bag and pipe in on, then spread it. It helps eliminate crumbs getting mixed into the frosting and adds the right amount of frosting. Store any leftover gluten-free lemon cake in an airtight container at room temperature. For the entire recipe and instructions see below in the recipe card. It’s moist but not wet, and it keeps well in an airtight container in the refrigerator. The tender cake, tart lemon curd filling, and smooth frosting makes the perfect lemony treat. If you are looking for other cake recipes, you MUST try my Gluten-Free Caramel Macchiato Cake (yes, I’m being bossy). If you are looking for a bright and colorful cake, my friend Brianna from Flippin Delicious makes the most lovely Gluten-Free Rainbow Layer Cake. Did you make this gluten-free lemon cake? I want to know what you thought! Please leave a starred review and comment below. If you have any questions, please let me know in the comments and I will get back to you. Flour blends: I've tested this recipe with Bob's Red Mill 1-to-1, Cup 4 Cup baking flour, and my gluten-free flour blend. When working with gluten-free flours or measuring gluten-free flour, spoon the flour into the measuring cup and level. Do not scoop your measuring cup into the gluten-free flour. You can make this cake with dairy, or without dairy. Use regular dairy milk and regular dairy butter. Lemon juice is acidic and can’t be replaced with extract which is usually alcohol based. Similarly, fresh lemon juice and bottled juice react differently. In many cases bottled lemon juice causes batter to get rubbery. If a recipe calls for fresh lemon juice, use fresh lemon juice. Lemon desserts are always so perfect for Spring! That looks like the perfect spring cake! Sounds so vibrant in flavour with just the right amount of richness. 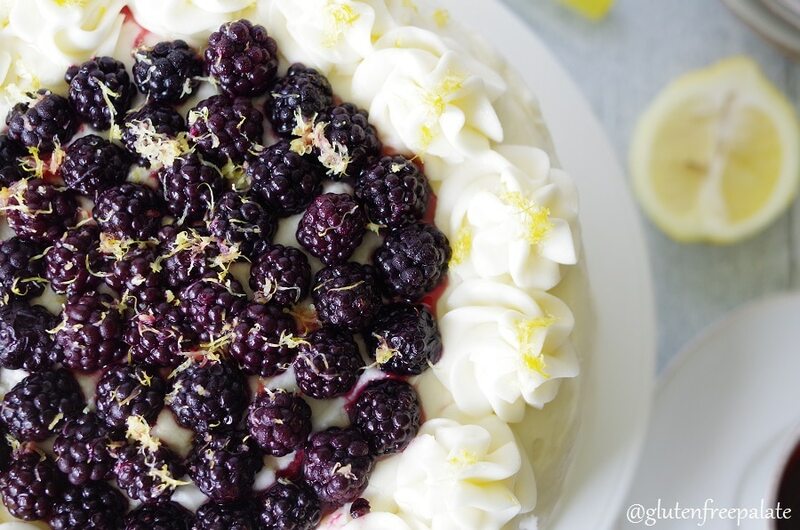 Lemon is one of my favorites, but gluten is not, so you’ve made the perfect sweet treat for me. Thank you! Just the other day I was thinking that I need to find my old lemon cake recipe and spruce it up a bit, but you knocked yours out of the park. And those blackberries on top- I can’t even! Looks so delicious!! The top of that cake is so beautiful! Love the fruit with the icing! 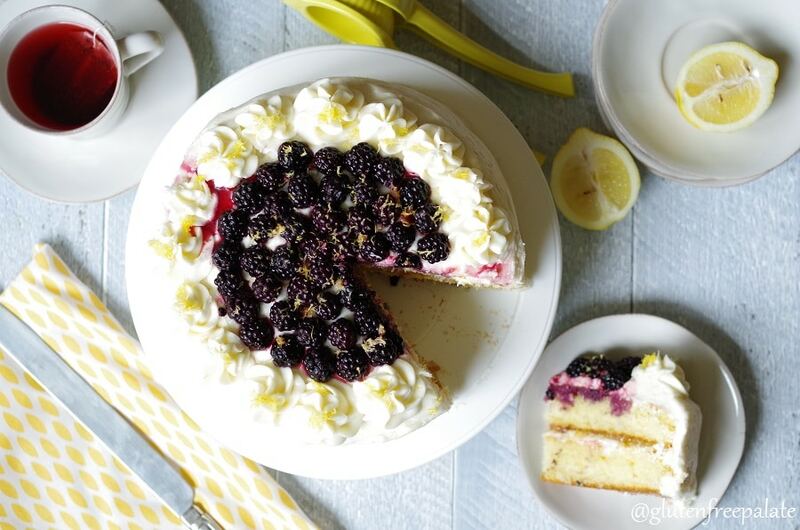 I topped the cake with a buttercream frosting, then topped it with fresh blackberries and a lemon zest. I hope that helps. This looks like a delicious gf option. Can I use regular milk in the cake and real butter in the frosting and get the same results? I would assume so, but wanted to double check. Yes. You can use regular milk and butter and get the same results. You can use fresh whipped cream as the frosting. The soooooo much. My moms gonna love this, it’s her birthday Sunday so im making her a cake, and a wine tasting and tour. This cake is right up her ally. Again the so much, this rlly helped. You are welcome! You could also skip the lemon curd and layer the center with fresh berries. Congrats on your new baby! I haven’t doubled this recipe, but it should work fine. Just make sure not to add to much batter to each of the pans or it won’t cook evenly. Also, you’ll have to cook the cakes at the same time so that the baking powder doesn’t fall flat. It might take a little longer to bake with that many cakes in the oven. My son chose this cake for his birthday. Mine was not nearly as pretty as yours, but my husband said it is the most amazing cake I have ever made! 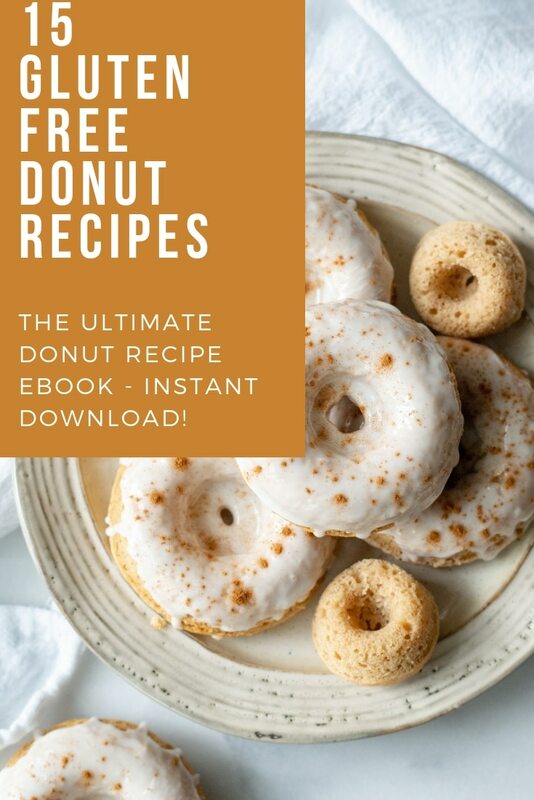 I am dreaming up variations- replacing the lemon in the batter with almond extract and using homemade cherry pie filling in the middle with a vanilla/ almond frosting! Thank you for the wonderful recipe!! So glad you liked it! It’s one of my favorites too. Than you for letting me know. I made this and it was a horrible flop that needs to be thrown out. I’m wondering if it is because I substituted coconut oil for vegetable oil (which I never use)? It was swimming in oil in the pans and the outer edges are crispy and the inner more normal. Each bite is oily. Yuck. Glad others were able to make this work, but I wouldn’t substitute something for vegetable oil again. So sorry to hear that something didn’t go right when you made this cake. Swapping oiling woulnd’t have made it oily. Is it possible that you didn’t add the correct amount of oil? Or possibly that you didn’t add the right amount of gf flour or sugar? I know that even with recipes that I’ve made a hundred times, I can sometimes accidentally overlook an ingredient. 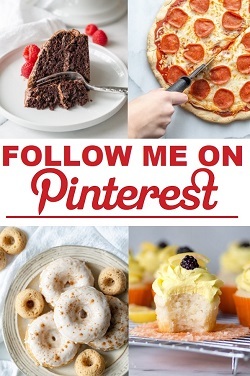 Hi, this cake recipe looks delicious! I’m going to make a wedding cake for my sister soon, and I’m looking for a good gluten free dairy free recipe to use. Do you think this cake would work if I make tiers. Do you think it you be sturdy enough? Thanks. I’m not sure how many layers you plan on making, but it should be sturdy enough. It’s a tender cake, but it’s not overly soft. I’m sure you’ll make it in advance to get a feel for the recipe and see if it will work for stacking. Let me know what you think! I’ve tested this recipe a few times. And I’m I’m finally going to make the cake for my sister’s wedding tomorrow. The wedding is Saturday. It’s going to be a three layered, three tiered cake. I’m going to just ‘naked ice’ it. Which is basically like leaving it at the crumb coat stage. And It will have berries on the tires and deer for cake toppers. I’ll let you know how everything thing turns out! I am making a wedding cake in September, and I’ve just started testing Gluten free comet lemon recipes. I am very excited to try this one. I plan to use Gfjules flour. 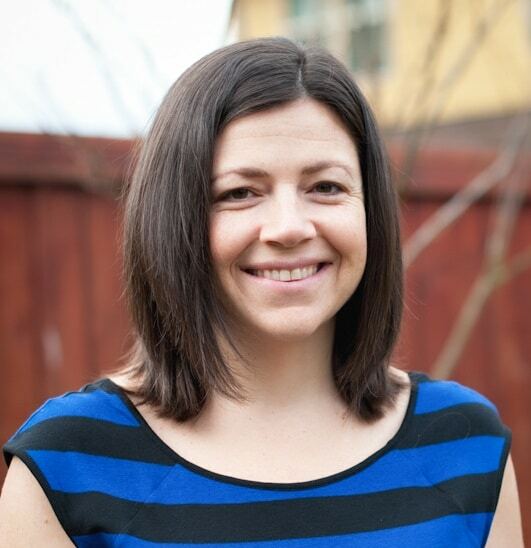 The cake will consist of 2, 10″ round tiers, and each tier will have 4 layers that will each be 1″ thick. The filling will be lemons curd. Of course, I will dowel the first tier. Ana, how did your cake turn out? Any issues or tips you care to share?? Chrystal, do these cake layers torte well? I’m not sure if I should bake 4, 1″ layers per tier or if I can cut each 2″ layer in half. I’m wondering if the cake once cut will hold up well with the lemon curd filling. Thanks, ladies!! Here I go!! To make it for my gf daughter for Easter. Did you add sugar or anything to. 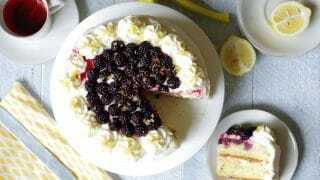 Lack berries before placing them on the cake? I used fresh blackberries (no sugar in them). This would be perfect for Easter for my gf guests. Will this recipe work in a bundt pan?? I haven’t made it in a bundt pan yet. Is this suitable to freeze? I’m planning to make this today(Monday) for Friday. I’ve frozen the cupcake version, so I imagine this cake would freeze well too. I’m excited to try this, but want to make cupcakes. I noticed you said you’ve frozen a cupcake version. How long did you bake the cupcakes and did you change anything in the recipe? Thanks! I’m about to make this cake in a couple days- if I use your gf all purpose blend that you’ve linked in the recipe, will this work okay? Also, is this a sturdy cake? Or is it too moist? My mix will work, or you can use Bob’s Red Mill 1-to-1 flour. This cake is heavier, and it is a moist cake, but it’s not like a flourless cake. It’s more like a dense bakery style cake. One tip is to make sure to use fresh lemon juice. Bottle juice makes the batter gummy. Hope that helps! Absolutely delicious!! I’m planning on making another one and freezing it for a birthday during a camping trip. Made the cake and frosting dairy free and made lemon curd from scratch that is also dairy free. I’m so glad you like it! Thank you for taking time to stop by and let me know. I am testing recipes for a friend’s wedding cake. I’ve just put the first batch of this recipe in the oven, but I have a couple of questions. Is the batter supposed to be lumpy? Normally, I know it isn’t, but this batter turned out lumpy for me. I’m not very familiar with gluten free baking, so maybe the lumps bake out? I followed the instruction, first combining the sugar and oil and then adding eggs, beating for 1 min. Then I poured in the dries and added the remaining wets while the mixer was running. Is that where I went wrong? Also, are you using a whisk attachment or paddle attachment on the electric mixer? I have made this cake several times and it’s never been lumpy. With that said, you also don’t want to over-mix it (which wouldn’t cause lumps, just a general gf baking rule). Did you use fresh lemon juice (not bottled as it tends to be a different acidity level)? Yes, I did use fresh lemon juice. Happy to report that the lumps did bake out and the cake was delicious!! Do you recommend a whisk or paddle attachment for this recipe? Good news..This is the cake the bride and groom chose during their tasting!! I’ll be doing more testing for a 10″ round with 4 tiers! Thank you!! Looks yummy! I want to make it for my sister’s bday; she’s gluten free. I’m not familiar with gf baking soda; can I use regular baking soda? This recipe calls for gluten free baking powder. Some baking powders are cut with wheat. If you look on the label you’ll see if it says gluten-free or not. Hope that helps. Hi! I will be baking this cake for my husband’s birthday this weekend. I have no time to test it before, and I’m making the list to get all the ingredients tomorrow. Would you share with me what product/brand do you use for dairy free butter? Thank you! I’ve used a few different brands but Earth Balance buttery spread is the most available in my area. You can also use your preferred brand (regular or dairy-free butter). Happy baking! I usually bake mine the day before. If I make it in advance, I wrap it with cling wrap and freeze it, then pull it out the morning I am ready to frost and serve and bring it back to room temperature. By dairy-free milk, do you mean something such as almond milk? What do you use? How did you make the Lemon Curd filling? am I missing something? there does not seem to be any lemon juice in the cake batter recipe. The last two ingredients under the ingredients for the cake are 2 teaspoons lemon extract, Zest from one medium lemon. I’m looking forward to making this, but wonder if you make your own almond milk or what brand do you use? If you make your own, what proportion of almonds to water do you use? I don’t want to take any chances of it not turning out! I havne’t made my own almond in a long time 🙂 We’ve been using blue diamond almond milk. I can’t find bobs red mill 1 for 1 at my store but gave the all purpose baking flour. The package suggests using xanthan gum. Is this necessary? This looks delicious! I’m going to make this for my son’s 13th birthday tomorrow! Just one question…will it work to substitute flax eggs for real eggs? Since I’m allergic, I hope to make it so I can eat a slice too. I can use this substitute most of the time, but there have been a few recipes in which it simply doesn’t work (brownies & cauliflower pizza crust are two big no-no’s!). Scared to try and mess the whole thing up without being sure it will work! I haven’t made this cake using flaxegg, but I imagine it would work, it just won’t have the same spongy/fluffy texture. If you have baked cakes using flax egg before, then you know what I mean about the difference in texture since the eggs help the cake to rise more. I haven’t tried butter in this recipe in the cake, but with my vanilla cake butter works. The texture is a little denser (not as fluffy) but it’s still good. I hope that helps.